CODA (now Cox Architecture) transformed an existing sawtooth warehouse and office into a flexible space for entrepreneurship. Located in a pocket marked by turn-of-the-century terraces and light industry, this project reinstates the area as an urban village. The architects introduced a series of intertwining uses that together create a connected hub of activity. At the front sits a co-office space comprised of separate offices and a boardroom. 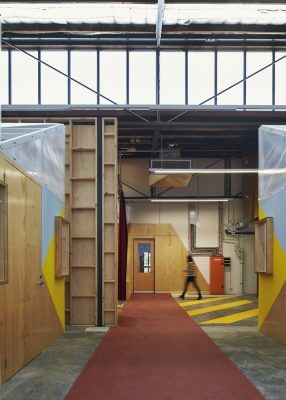 Within the larger warehouse, playful pods create areas for individual work. 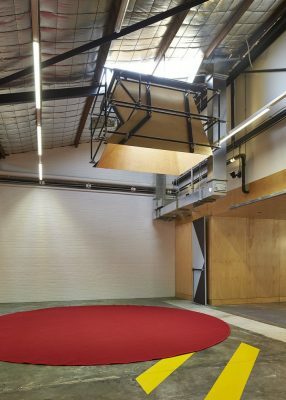 An event space, defined by a circular carpet and light scoop, and cafe link these spaces to the broader community creating a dynamic and porous interface. Aesthetically, the design draws inspiration from Jeffrey Smart’s celebration of the gritty interface between transport and human existence. 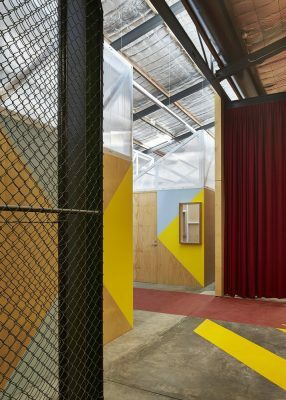 Industrial materials have been overlaid with primary-coloured graphics; exposed timber frames are paired with cyclone fencing and warehouse shelving. The building has been reimagined as a contemporary warehouse – designed to produce ideas. Given the nature of the project (upgrade of a warehouse into a multi-use/multi-class space), several disciplines needed to be coordinated to achieve compliance. These included ESD, BCA, Fire, Hydraulic, Electrical, Mechanical and Structure. The Project Management contract demanded that the client, builder and architect work closely together throughout construction. 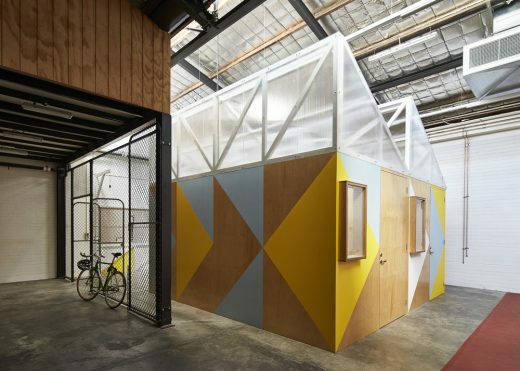 The conversion of an existing warehouse and office into an environment that could foster young businesses through a structured accelerator program. The idea of ‘succession’ was posed as both a business strategy and design philosophy, suggesting an environment for new economic outcomes beyond corporatization. 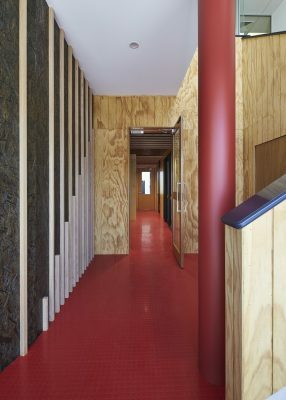 The project is a unique amalgam of private and public space, connecting to the neighbourhood and broader community. The project engenders the sharing of ideas, thinking, making, gathering and connection. This project is a response to the desire for local, small-scale activities that might sustain us economically. 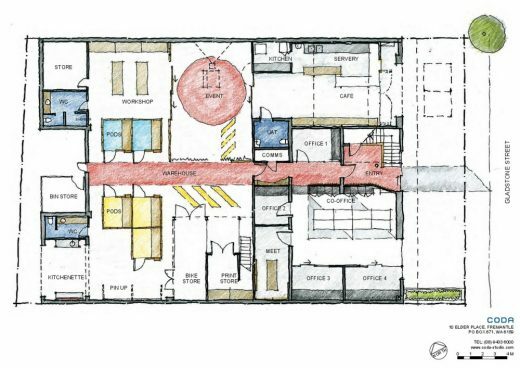 The project provides formal and informal space for users to create strong connections with each other; it engages with the neighbourhood; and provides professional, supported spaces in which the local can become global. 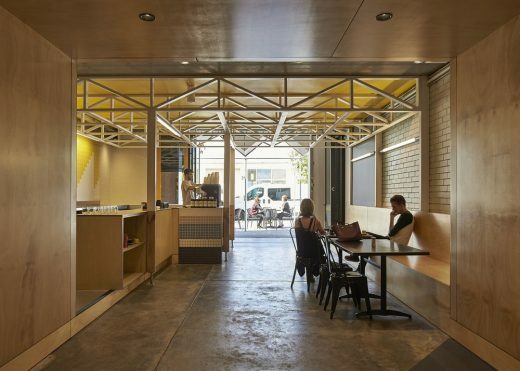 This project reinstates small-scale industry into an inner-city neighbourhood through the insertion of a cafe at its street front and maker spaces behind. 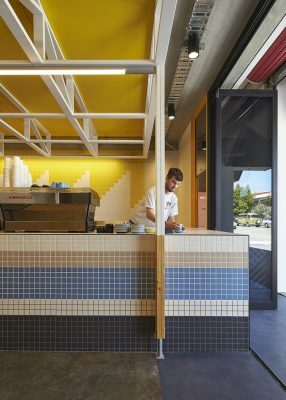 An event space links the cafe and opens to the working space beyond, blending traditional boundaries between public and private. Aesthetically, the design draws inspiration from the artwork of Jeffrey Smart and his celebration of the relationship between freeways, transport and human existence. An industrial palette of materials has been overlaid with strong coloured graphics, again alluding to both the client’s fascination with the succession movement and the latent power of contrarians. CODA’s response was to design a series of intertwining and porous spaces. 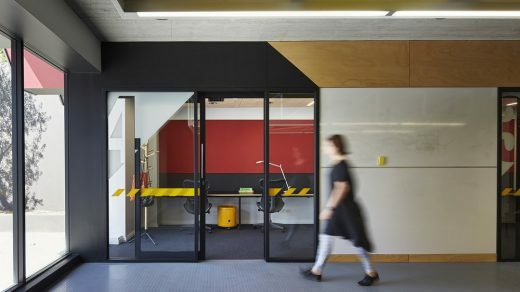 At street front, the existing warehouse administration is re-worked to create a co-office space comprising four separate offices, a large communal work desk and boardroom. 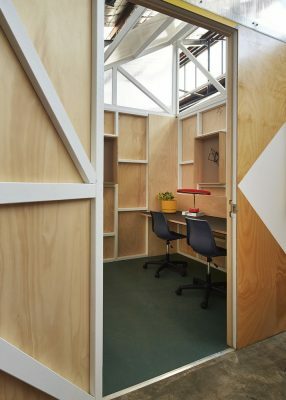 Within the larger, saw-tooth warehouse, secure working pods create areas for sustained individual work with social spaces in between. 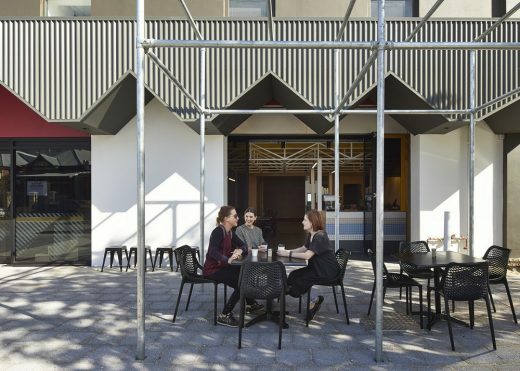 An open gathering space, defined by a circular red carpet and dramatic light scoop, and the street-front cafe link these spaces, creating a dynamic interface with the neighbourhood. The project involved the adaptive reuse of a building, rather than starting anew. The space was consciously designed to be adaptable over time. Materials were chosen for their ease of fabrication and ability to be recycled. Many of the warehouse’s raw finishes were left exposed, rather than adding new, purely aesthetic finishes. Evaporative cooling in the warehouse part of the project. No provision for car parking, instead a bike store and bike repair area are included. An ESD consultant was engaged for the Section J Assessment. Social sustainability is encouraged through the cafe and events space for community events and talks.